Homeowners throughout Nashville know that when they call Renewal by Andersen® for their replacement windows, they’re getting a high-quality window from a window company they can count on to do the job right. With over two million windows replaced nationwide, you know you can trust your local Renewal by Andersen team. We approach every job with respectful professionalism and tailor each project to the individual home. If you’re looking for energy-efficient replacement windows that look great and last, call us. We’re the only local window company offering the exclusive Renewal by Andersen Fibrex® windows. Because Fibrex window frames have less heat transfer than metal or vinyl window frames, your windows and home will be cooler in the summer. Our advanced glass options are significantly more energy-efficient than standard double-pane windows. And, with many interior and exterior finish options, you’ll never have to scrape and paint your windows again. Only Renewal by Andersen of Nashville offers the full line of replacement windows and doors from Andersen. Whether you’re looking for traditional double-hung windows or something different like sliding windows or casement windows, we have many styles perfect for any home. If it’s also time to replace your sliding door or patio door, we have options that coordinate perfectly with your new windows. Of course, every window and door we sell and install is backed by superior warranties. You can only get the Renewal by Andersen® 20/10/10 limited warranty when you work with our certified team. Your windows are covered from the installation to the frame, sash and glass. Few window companies offer an installation warranty, let alone for 10 years! When you call us for a free in-home estimate, you’re getting more than just a price per window. One of our expert team members will guide you to the best options for your home’s style and your desires. We’ll measure each window opening and provide a quote for windows made for your exact size windows. Unlike big-box stores, we custom-build each window which minimizes changes to your window frames during installation, making for better-fitting windows. Call (615) 238-9463 or fill out our contact form to schedule your in-home consultation today. 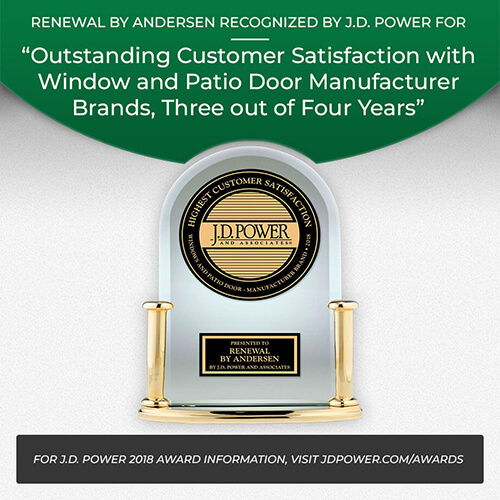 You’ll love your new windows and doors from Renewal by Andersen!